Science fiction has a long, colourful tradition of books about people with very special powers, abilities focused in specific privileged lineages through extended eugenics programs. See, for example, Doc Smith’s Lensmen series, Heinlein’s Howard Family stories and Larry Niven’s Known Space. Generally being a participant in these programs isn’t a bad thing, even though it constrains one’s choice of mates somewhat, and I cannot help but feel the fact most of the authors who come to mind are white and middle or even upper class – not the groups usually subjected to such programs, upper class inbreeding aside – plays a role in how the whole affair is portrayed. I think it is safe to say Octavia Butler, one of the very very few African American science fiction writers active in the 1970s, had an entirely different model in the back of her mind as to how the whole directed breeding program would work out in real life. Until about 18651 the US had a distinct population whose activities were overtly closely monitored and closely controlled; a pattern that just leaps out at anyone who isn’t a mouth-breathing libertarian or worse is that despite whatever the propaganda of the day said, the program was not being run for the benefit of its subjects. Anyanwu lives as a god among her power, an immortal shape-shifter whose control over living material allows her to heal others. Doro too is an immortal with a keen interest in people like Anyanwu. In fact he has been collecting people like her – telekinetics, doomed telepaths, and so on - for millennia. Anyanwu is unique in that she is the only other immortal he has ever encountered; when he stumbles over Anyanwu’s existence Doro is eager to add her to his collection. He is seductive enough that Anyanwu agrees to accompany him through the hellscape of an Africa subject to repeated slaver raids and off to the New World, not the most ideal place for an African at this time. Alas, Doro is an obligate psychic predator forced to hop from body to body to sustain himself and his interest in people with special gifts is because their minds taste best when consumed. He is no Charles Xavier or even Magneto gathering allies but a nomadic herder engaged in an extremely long duration breeding program and any empathy he might seem to have for his food is almost purely an illusion. After the penny drops, she sticks around because she has fallen in love with Isaac, one of Doro’s subjects. Isaac convinces Anyanwu to stick around with a telling argument that the author carefully keeps hidden from the reader much as I am doing now. Anyanwu doesn’t have a lot of cards in her hand when it comes to bargaining with Doro but she has a few (she can, for example, run away in the form of an animal whose mind Doro cannot perceive) but his powers and willingness to use her loved ones as hostages mean that the balance of power is very much on his side. Her love for Isaac is enough that she puts up with Doro’s use of both of them in his breeding programs, and Doro’s casually murderous customs. Her persistence is paid most poorly. Anyanwu builds a new life for herself, one with a community of gifted who she nurtures rather than exploits. Doro of course ruins all this by tracking her down and while he tries to convince her they can reach a tolerable accommodation, not only do his misjudgments provoke terrible tragedies but he cannot change his predatory ways or his profound empathetic deficits. In the end, Anyanwu comes to the conclusion there are only two paths: submit to Doro in the knowledge that even when he tries very hard to be less than a total monster for the sake of the only person who shares his immortality he will still be a horrible person, or escape into death. Doro is the only one in a position to argue out of this and of course this is one game where he is the one stuck with terrible cards. Sooo, not the most upbeat novel the psionically gifted that I have read. This is a prequel to early Butler novels, Patternmaster (1976), Mind of My Mind (1977), and Survivor (1978) and would be followed by one more novel, Clay’s Ark (1984). I regret to say the long term outcome of Doro’s programs is not a positive, although at least he eventually comes to a suitable end (which of course any Butler fan would have known about when reading this). In case anyone cares, the internal chronology is Wild Seed, Mind of My Mind, Clay’s Ark, Survivor, and Patternmaster, although it doesn’t really matter in which order you read the last two. If you read them in publication order you can watch Butler hone her skills, which is why I would reread them all that way. But now that I’ve noticed the politics in SF, they seem to be everywhere, like packs of little yapping dogs trying to savage your ankles. Butler’s books can be seen as exactly the sort of work I imagine would make Bujold uncomfortable; instead of acceptable white middle class fantasies about doing to aliens what Europeans did to the natives2, winning social position with well chosen marriages or building grand monuments to human ambition, Butler is a spoilsport who focuses on people way, way down at the bottom of society, people for whom “the right to choose with whom I have children” may well be an unattainable dream, people forced by circumstances well outside their control to bargain with monsters in the hope of salvaging the tiniest crumb of what matters to them. Butler’s characters don’t really get to have victories; instead they have to settle for tolerable defeats. 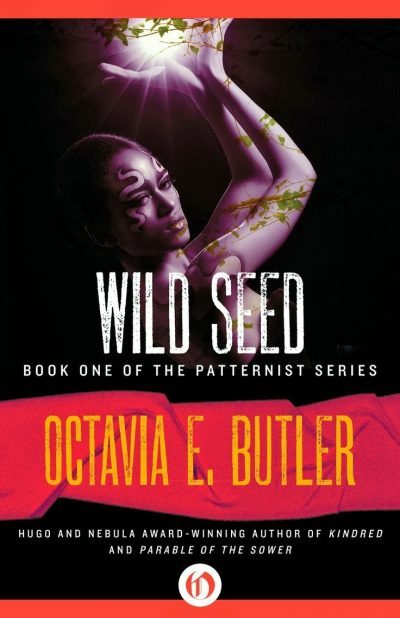 I am happy to report that available as ebooks from Open Road Integrated Media, who offer an assortment of Butler’s books, both the ones in the Patternist series and others. This is my formal acknowledgment that while legal slavery ended when the Slavers Uprising was crushed, it didn’t take long for old traitors to come up with new ways of controlling America’s black population. Butler does have one book that fell into that mold, Survivor. It is also by far her worst book and not, I believe, in print in any form.